that's easy to maintain, inviting and durably long lasting. Concrete tables at Markstaar - Architecturally pleasing to your eyes and budget! 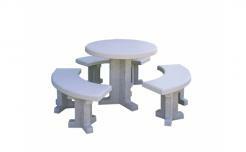 Markstaar offers a wide variety of concrete table designs for indoor and outdoor environments. Custom concrete table designs available by special request.